Prepare yourself for the new surprise of DUO Combat ability new weapon that can let you do Popping and Cast Jigging in one rod. Taka-Pi fires a popper further, more accuracy with less effort than you ever imagined. Incredible torque lifting power thanks to the 99% high performance graphite blank and PYTHON wire wrapping surface technology. 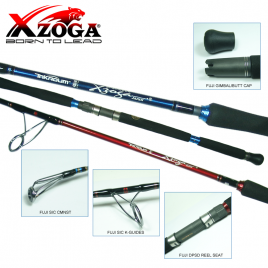 Super thick wall design increases the power and toughness of the rod. Equipped with 100% Japan FUJI components, precision designed Power Transmission Fighting (PTF) action, V9 + SS concept performance design. Monster GT, Giant Tuna, Big Billfish, or any giant fish will be defeated with ease. Taka-Pi will be the most tempting rod collection you won’t want to miss.